Yesterday I stumbled upon a very interesting blog. The blog was about Introverts. Later I discovered that the blog was inspired by a book, so I decided to give the book a try. And as I expected, the book was as interesting as the blog. The name of this book was ‘The Introvert Advantage- How to strive in an Extrovert world’. As the name suggests almost everything about the book, therefore I will not waste your time on the overview of the book. When I was reading the first chapter, I was feeling as if this book is talking only about myself. As if the author knows me more than I myself do. It was this feeling which compelled me to write what I learned from the book. Because I believe there is a world of Introverts (like me) out there, which can be helped by the learnings from this book. Now I have talked enough about the package (read the book) it is the time to see what is in this package. Here is the index of what you are going about to learn from this post. The book first explains us the working of an introverted brain. So let us start from there! To answer this question in a single word, we can say an introvert is an ‘Innie’ which means he gets all his energy from his inside. Spending time alone, thinking, reading & contemplating are a few things which give energy to an introvert. An introvert observes inputs from outside world slowly, but deeply. He churns, chews and digests the inputs better than extroverts. This is why an introvert has deep knowledge on specific topics. Everything which is inside his brain is the source of energy which makes him charged like a battery. His own inner world charges him, but the world outside discharges his energy. Spending too much time outside, with too many people, talking too much, living fast-paced life are a few things which consume an introvert’s energy. When he loses his energy, he needs to charge himself by going back to his inner world for a while, and this happens quite often. If he cannot go back, then he becomes overwhelmed and sometimes shuts his minds saying ‘No!’ to any more inputs from outside world. Additionally, an introvert believes more in-depth than in breadth. He prefers to have few friends with deep friendship than having too many friends. He prefers to know a few things thoroughly than having a little knowledge of everything. This is the reason why an introvert becomes very talkative when a topic of his interest is being discussed, otherwise, you will mostly find him silently observing others. This quality of an introvert makes him a deep thinker, keen observer, creative, innovative, rational, dreamer and what not! 1. To focus on collecting words and thoughts, they reduce eye contact while talking. Whereas while listening they increase their eye contact. 2. They often surprise others with the wealth of their information. 3. They may not like much attention or focus. 4. They appear glazed, dazed or zoned out when stressed, tired or in groups. 5. They may start talking in the middle of the thought, which can confuse others. 6. They may have a good memory but they may take more time in retrieving that memory. 7. They can forget things they know very well. They might stumble around when explaining their jobs. They can temporarily forget a word they want to use. 8. They are clearer about ideas, thoughts, and feelings after thinking about them. 9. They may not be aware of their own thoughts until they do not write them somewhere or tell them to someone. 11. They may have a calm and reserved manner, they may walk, or talk, or eat slowly. 12. They may need to regulate their protein intake and keep track of their calories. 13. They must have breaks to restore their energy. 1. Introverts can change themselves into Extroverts- It is not possible for both Introverts as well as Extroverts to change themselves because introversion and extroversion are temperaments. Temperament is the nature of a person, one cannot change it but one can adjust according to it. 2. Introverts are Quite and Withdrawn-Introverts are not quite and withdrawn. They just need some time to think things through at a quiet place to recharge themselves. They do not like to interrupt people, they are perceived as different, all such situations force them to speak less in front of Extroverts. 3. Introverts do not like People-Introverts like people but a few people are interesting to them. This is also one of the reason because of which Introverts have few friends. 4. Introverts are Shy-Shyness is a state of nervousness which comes mostly from meeting people. It can be a mental illness suffered by Introverts as well as Extroverts. But confident Introverts is not a rare sight. 5. Introverts are Self Centered-Introverts are not self-centered. As they have few interests and few friends, they interact openly with these friends. Since they live aloof to uninteresting people, therefore these uninteresting people assume introverts as self-centered people. 6. Something is wrong with them-Introverts are often told that they should not be like how they are. Their parents think something is wrong with them and their behavior. But introverts are completely normal and in my opinion, they are better than Extroverts. Now I should share the blog which compelled me to read the ‘Introvert Advantage’. 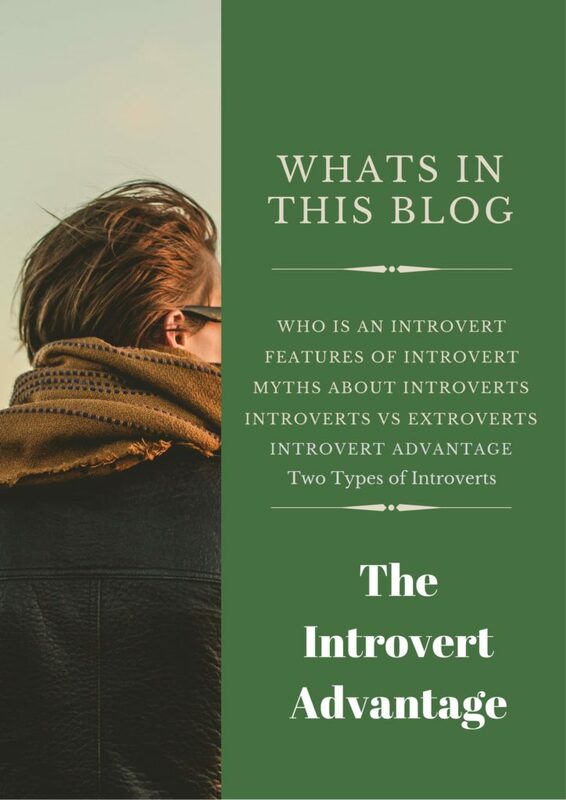 Since this blog was also about 10 Myths About Introverts, therefore it will provide some more information to you. The blog will resemble the myths you read above because both of the blogs are inspired by the same book. Important Note- Although it is not necessary for an introvert to be shy, but she is more susceptible to Shyness and the feeling of Guilt. Sometimes situations arise when we are seen as weird or wrong due to our behavior and out of Shyness, we start avoiding the people who saw us in those situations. We feel Shyness strongly than Extroverts but avoiding people and situations can make our life worse. To cope up with this problem we need to accept ourselves as for how we are. We need to understand that it is fair if we behaved in a way which was awkward for others because our brain is engineered differently. It does not mean we are awkward, it means we are distinctive. Being different is not a matter of shame. Accepting this fact will help in coping up with shyness. As I earlier said we are also more susceptible to the feeling of guilt than extroverts. Also, we feel guilt more than extroverts. We get hurt more easily and we presume the level of tolerance of others to be at par with us. But this is not necessary to be true. Maybe be you are over thinking that you have hurt someone but actually that person may not have felt offended by what you said. In this case, you are feeling guilty because of no reason. To avoid this, just clear the air. Ask the person directly if you hurt him. Even if you find out that you have hurt him, apologies for your mistake. What else can you do? As long as you are truly sorry and do not intend to repeat your mistake, you are doing the right thing! How are Introvert and Extrovert brains are different from each other biologically? Without going into too much of details, we can differentiate the two brains on the basis of 5 broad conditions. 1. Complexity of blood pathways in the two brains. 2. Direction of blood flow in the two brains. 3. Speed of signal flow in the two brains. 4. Neurotransmitters required to activate the pathways of blood flow. 5. Sensitivity of the two brains towards stimuli. 1. Complexity – An Introvert’s brain has a complex and dense pathway for blood to travel. 2. Direction – The direction of blood flow in an Introvert’s brain is more towards the inside of the brain. 3. Speed – Signals travel slowly in an Introvert’s brain because of the complexity and direction of blood pathways. 4. Neurotransmitter- Acetylcholine transmitter activates the pathway of an Introvert’s brain. This neurotransmitter is responsible for attention and learning (especially perceptual learning), ability to remain calm and alert, utilizing long-term memory, energy conservation, concentration etc. 5. Sensitivity – Since there is more blood inside the brain of an Introvert, therefore, his brain is more sensitive towards stimuli. This is why Introverts overwhelm when they receive too many inputs from the outside world or from their own inside. 1. Complexity – The Extrovert’s brain has less complex and less dense pathways for the blood to travel. 2. Direction – The direction of blood flow in an Extrovert’s brain is more towards the external parts of the brain. 3. Speed – Signals travel speedily in an Extrovert’s brain because of less complexity, density, and direction of blood pathways. 4. Neurotransmitters- Dopamine transmitter activates the pathway of an Extrovert’s brain. This neurotransmitter is responsible for movements, attention, alert states and learning. 5. Sensitivity – Since there is less blood inside the brain of an Extrovert, therefore, his brain is less sensitive towards external stimuli. This is why an Extrovert requires too many things to happen around him to get his brain stimulated and feel good. Introverts live longer- Because of their nature of conserving their energy, planning and thinking before acting, analyzing things, maintaining deep bonds with close ones, Introverts end up living longer than Extroverts. High attention, high learning, and better long-term memory –Because of a special kind of neurotransmitter called acetylcholine, present in more quantity in Introverts, Introverts tend to have high attention and learning capabilities along with better long-term memory. You can learn about some more introvert advantages by reading this blog on a website completely dedicated to introverts. Introverts are of two different kinds. As we all know that our brain is divided into two hemispheres, and one hemisphere dominates over the other, the same is the case with an Introverted brain. An introvert can be right brained (dominated by right hemisphere) or left brained (dominated by left brain). Depending upon which hemisphere dominates the brain of the introvert, he displays different talents, behavior, and limitations. The right brain is symbol oriented. The capability of associating symbols with a meaning comes from the right brain. For example, waving of hands means bye-bye. During the first two years of life, we use our right brain, this is why babies can learn sign language when they are about nine months old. Since the right brain has fewer language capabilities, therefore, it is difficult for them to verbalize their thinking process. Their thinking takes place in rapid, complex and spatial manner. They express better in body language, actions, free-flowing dancing etc. They are creative, multi-tasking people. They are emotional. They think in pictures. They notice patterns easily. Related- So you think Introverts cannot influence people? Think again. And i like reading this kind of summaries rather than reading whole book.